As life returns to normal, I'm preparing for it to go completely upside-down again. That's right, Passover is less than a week away. Unfortunately many of the things I had hoped to try out this year will have to be shelved. I hope to make a couple things at the end of the next week, but I don't really know if it will happen. In terms of a very short update on my life - hole remains in house. But just because I'm not baking...doesn't mean you can't! Here are a few of the Passover recipes I hope(d) to try out for this year' s holiday. Please let me know if you try any of them! 1. 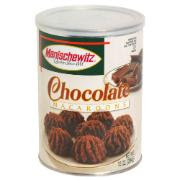 Coconut Macaroons - I have to admit, to the dismay of the majority of my family and friends, I am completely addicted to the canned Manischewitz coconut macaroons. I just love them, and the nostalgia they evoke, and I would eat them year round if I could. But I really wanted to try them out this year - maybe even with the bottoms dipped in chocolate. 2. Chocolate Cake - I've had some previous experience with flourless chocolate cakes, but been mostly disappointed. They're heavy and rich in a week that is already filled with dense and weighty foods. But this one claims to be otherwise! And with Smitten Kitchen behind the stove, I'm hopeful. 3. Chocolate Mousse - the best things available this week are those that don't require changes from their original recipes. My (mother's) chocolate mousse recipe contains two ingredients - chocolate and eggs. Use a little over an ounce of chocolate for each egg - I generally do 8 eggs and 10 ounces of chocolate. Separate the eggs, beating the whites until they form stiff peaks. Beat the yolks and slowly add the melted chocolate until thick and combined. Fold (do not stir!) the egg whites in, pour in to a bowl and let set in fridge. Done! 5. Passover Cookies - this recipe caught my eye on Recipezaar, mostly because of the positive reviews. It calls for both matzah meal and matzah farfel - goes against my rules, but could be interesting! Happy baking - let me know if you have any other recipe suggestions!